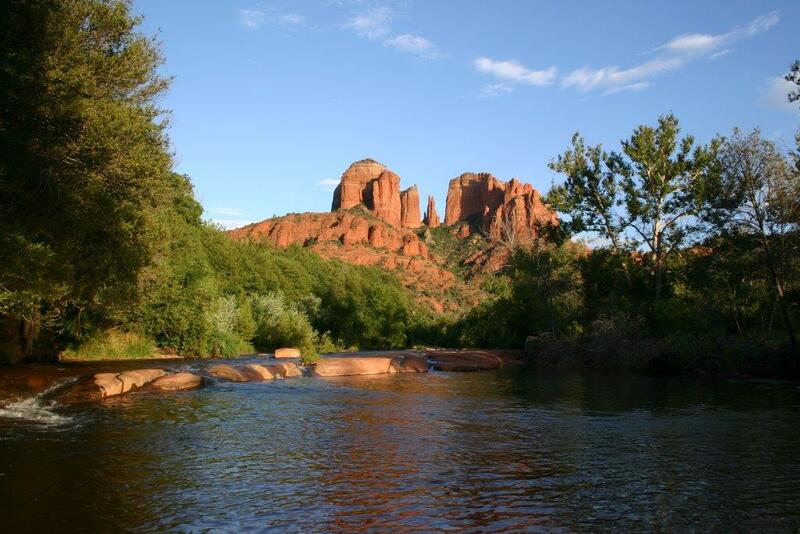 While there are a lot of communities that are jumping off points for the spectacular scenery of the America's Southwest, Sedona is right in the middle of it. Just taking a drive to the supermarket will take you by magnificent red rock formations and buttes that you're used to seeing only on calendars or in Western movies. The unique scenery has made the little town of 20,000 full-time residents a magnet for tourists, but the town government has worked to keep its Old West character. Commercial architecture is muted, with no high-rises, urban sprawl or golden arches. Because the scenery has a kind of spiritual energy (it was regarded as sacred by Native Americans), the town has also become known as a spa and retreat. 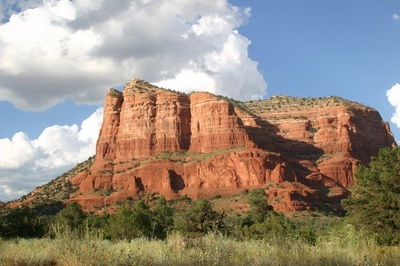 From the 1930s to the 70s, the Sedona area was the backdrop for scores of Western movies. 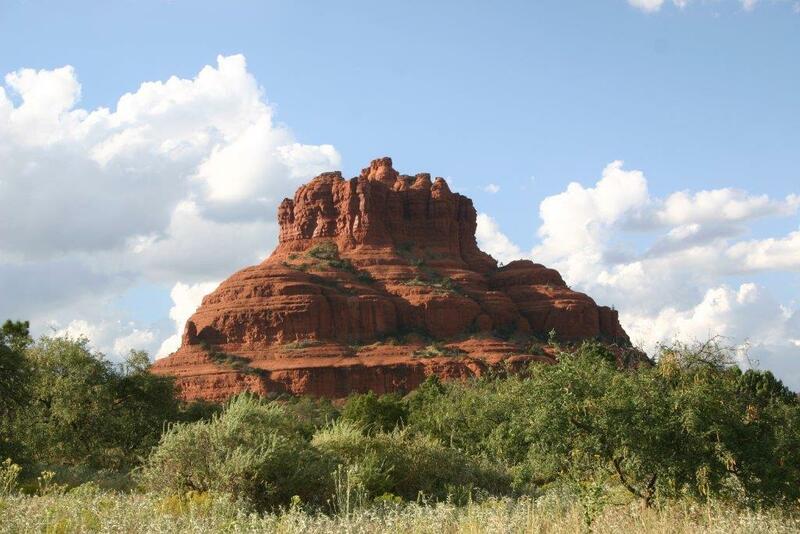 The Red Rocks - completely surrounding Sedona and the neighboring village of Oak Creek. You'll have a hard time picking your favorite from such formations as Cathedral Rock, Bell Rock, Courthouse Butte, the Devil's Bridge and the Grand Piano. 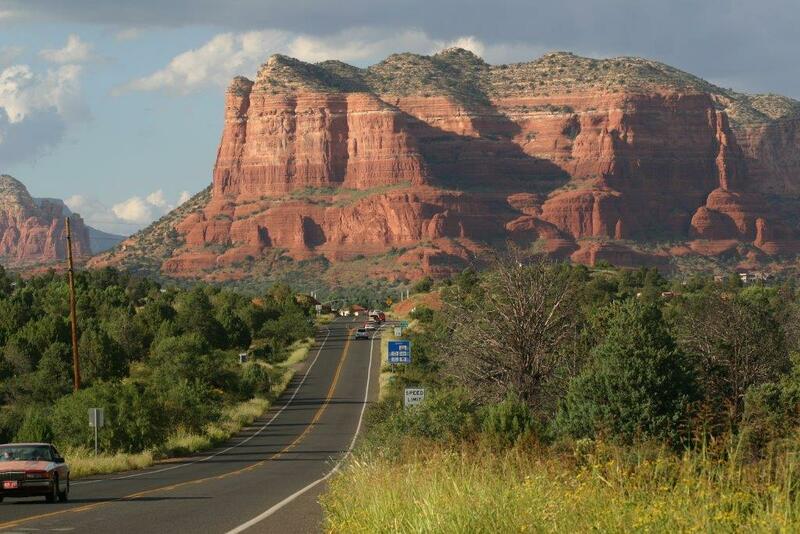 Coconino National Forest - 160,000 acres of scenic drives, vista overlooks and hiking trails. An orientation and geological history of the area can be obtained at rhe US Forest Service Ranger Station just outside the neighboring village of Oak Creek. Verde Canyon Railroad - a four-hour rail tour through mostly wild areas of the valley. Though the passenger cars are comfortable, the best experience is riding on one of the open, flat-bed cars and taking photos of the unusual rock formations. Holy Cross Chapel - built into the facade of a butte of the Coconino National Forest, the chapel is a both a spectacular architectural wonder and a magnificent expression of faith. 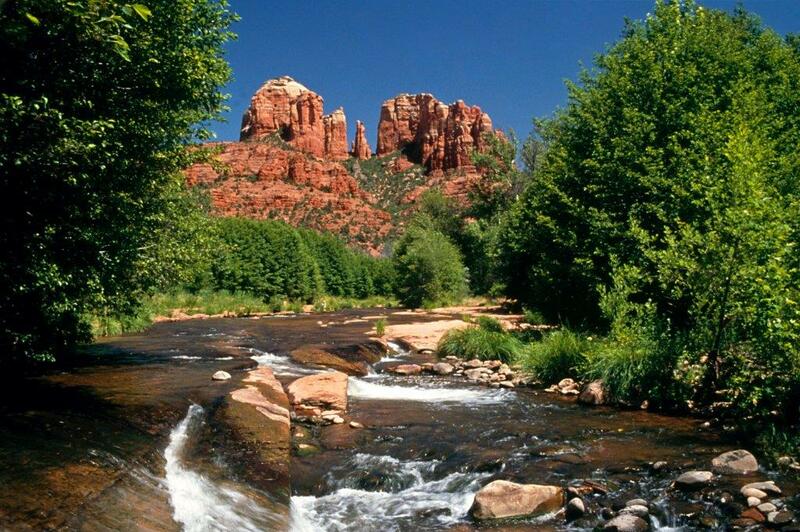 Though minutes away from the center of Sedona, many visitors are transported to a more spiritual world. Sedona Star Gazing - an evening of astronomy viewing planets, stars and galaxies in the desert skies, under the guidance of professional astronomers. Sedona Segway Tours - a different way to see the red rocks, on a two-wheeled electric-powered personal vehicle. Training is provided. Pink Jeep Tours - popular off-road adventure tours of the red rocks, canyons and gulches with experienced drivers. Dining - for a community in the middle of the Arizona desert, Sedona has a surprising variety of restaurants, from the New York Bagels and Deli (yes, they're just like NYC bagels), to the Chocola Tree Organic Oasis, a vegetarian restaurant that bespeaks New York's hippie East Village. 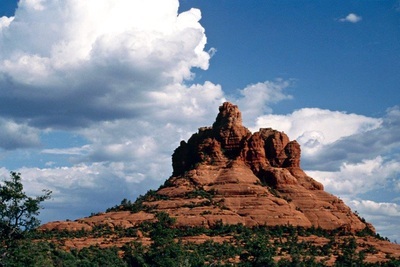 We also enjoyed the Chinese Szechuan Restaurant and The Juniper Bar and Grill, which, despite its name, is a country club grill overlooking a golf course and the beautiful Bell Rock, my favorite of Sedona's unusual formations. Shopping - not surprising that a town surrounded by so much natural beauty is imbued with art galleries. There are also many emporiums for Native American jewellery and Southwestern antiques. Hotels - Sedona's got a host of them, from international chains like Hyatt and Hilton, to spa resorts and B&Bs. People - Some of the friendliest you'll ever meet. Many are transplants, causing this New Yorker to wonder, "Did all the nice people move to Arizona?" For further information on Sedona, go to www.visitsedona.com, and want to see why locals call it "The most beautiful place on earth."